During the early modern era (c. 1600-1800), philosophers formulated a number of new questions, methods of investigation, and theories regarding the nature of the mind. The result of their efforts has been described as "the original cognitive revolution". 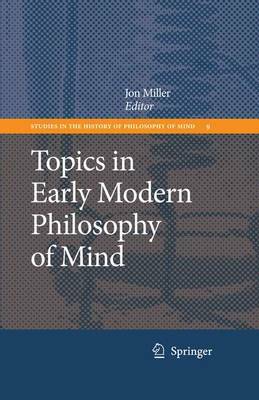 Topics in Early Modern Philosophy of Mind provides a comprehensive snapshot of this exciting period in the history of thinking about the mind, presenting studies of a wide array of philosophers and topics. Written by some of today's foremost authorities on early modern philosophy, the ten chapters address issues ranging from those that have long captivated philosophers and psychologists as well as those that have been underexplored. Likewise, the papers engage figures from the history of ideas who are well-known today (Descartes, Hume, Kant) as well as those who have been comparatively neglected by contemporary scholarship (Desgabets, Boyle, Collins). This volume will become an essential reference work that graduate students and professionals in the fields of philosophy of mind, the history of philosophy, and the history of psychology will want to own.